Hi there! Did you enjoy that extra hour in your day as much as I did? Sunday felt like it was never going to end, which is a good thing:) Over the weekend, I experimented with a Thanksgiving tablescape in a black and gold color palette. The runner, gold charger plate and black plate with gold trim are from Z Gallerie. The chevron plate is Mikasa. 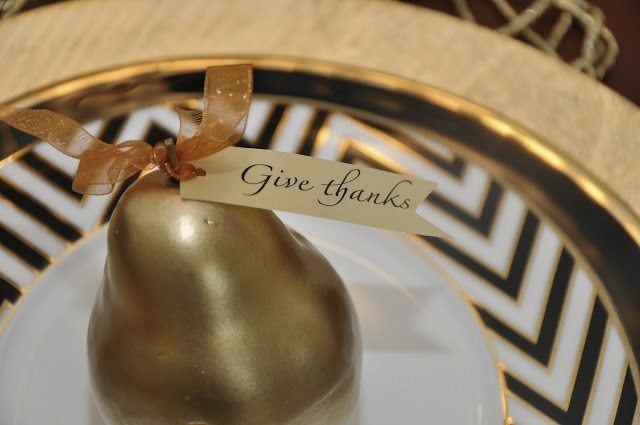 I printed “Give Thanks” on my computer in “Zapfino” font on gold vellum paper and tied it to the pear stem with a sheer ribbon. 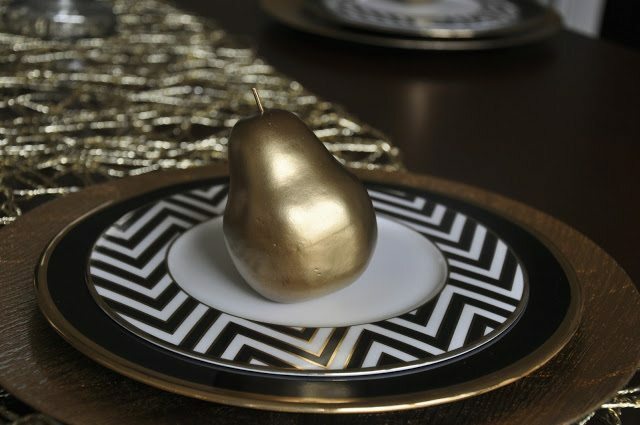 The decorative pears were glammed up with some metallic gold spray paint. 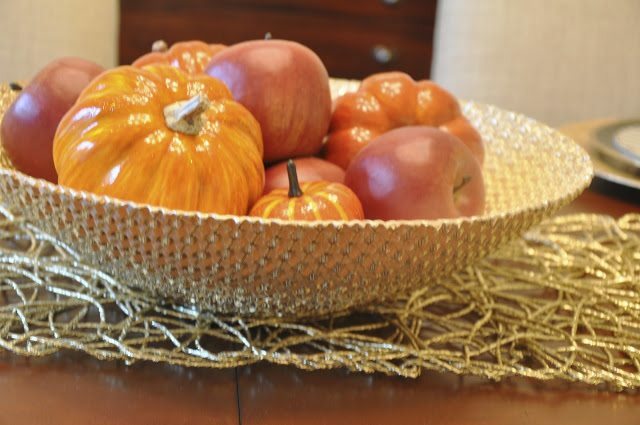 I also found a big gold bowl at TJ Maxx for $17 and filled it with apples and pumpkins. I’m still working on the finishing touches, but it’s coming together! Are y’all looking forward to Thanksgiving too? Beautiful! So much to be thankful for this year…oldest is graduating with a great job, and the youngest has been accepted to two of her 8 choices of colleges! Wow! I love! The runner is gorgeous as well as the plates and pears. I love the labels–did you print them out in that shape somehow or did you hand cut them? Thanks for sharing what font you used as well! I cannot wait for Thanksgiving and a long weekend at home with wonderful friends and family! Pear with "Give Thanks," so cute, elegant, fun. I love it! I am dying when I saw your bowl!, I just bought the small and large of that same exact bowl at Home Goods lol. I am using it my closet for my watches and bracelets. 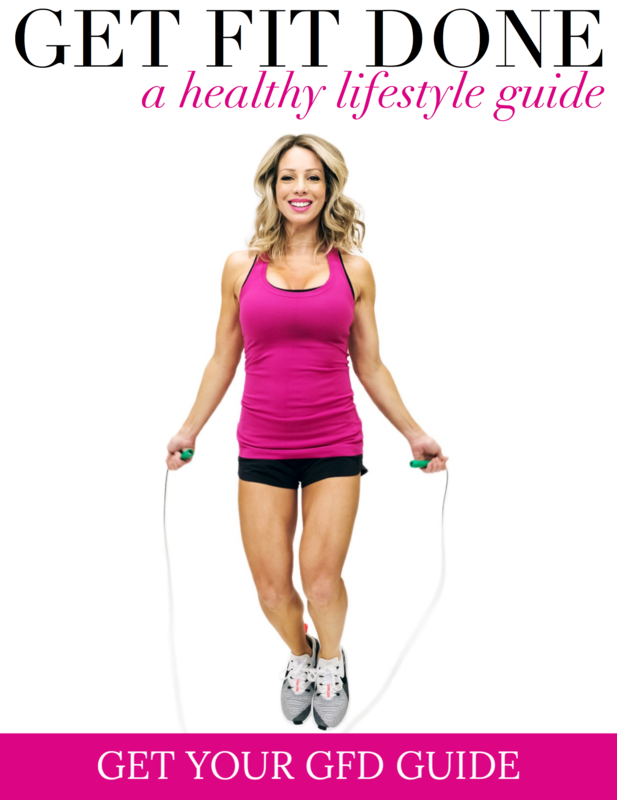 You should use it in your closet after the holidays. It really sparkles under the light. And you can see your jewelry easier. love love the chevron plates!! and the pears look beautiful!! Love the pear with the 'give thanks'. Very cute. Im not usually a gold fan, but this looks very lovely. I love the gold pears! And the table runner is beautiful. Where did you get it? 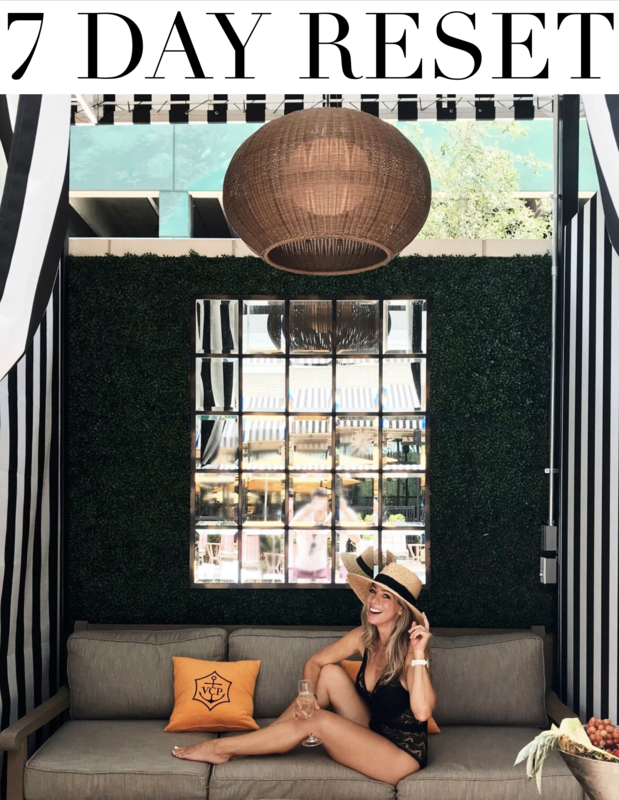 Simple & classic, balck and gold always works! 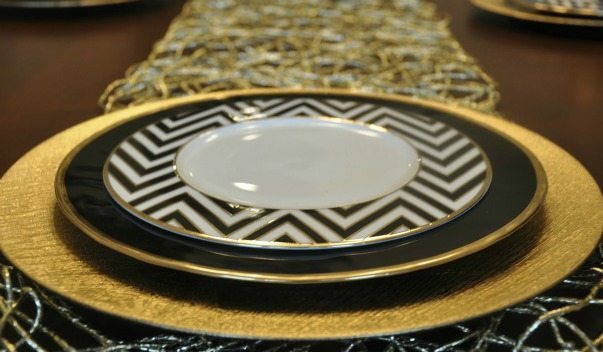 Beautiful choices, the chevron plates are the perfect addition to jazz it up! the gold and black is just glam gorgeous! cant wait to see more! Table is looking great. The black and gold is so beautiful. Not hosting Thanksgiving so my mind is already swirling for Christmas. I need to bookmark this for next year! I must have those chevron plates! They are gorgeous! Black and gold is one of my fav combos. This is stunning! It's beautiful and elegant, Megan! 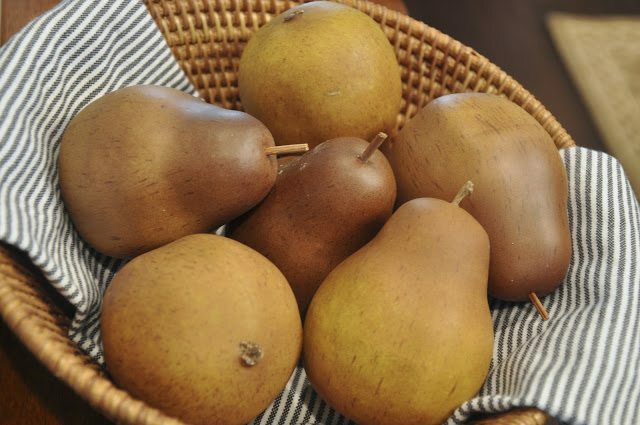 I love the gold pears! 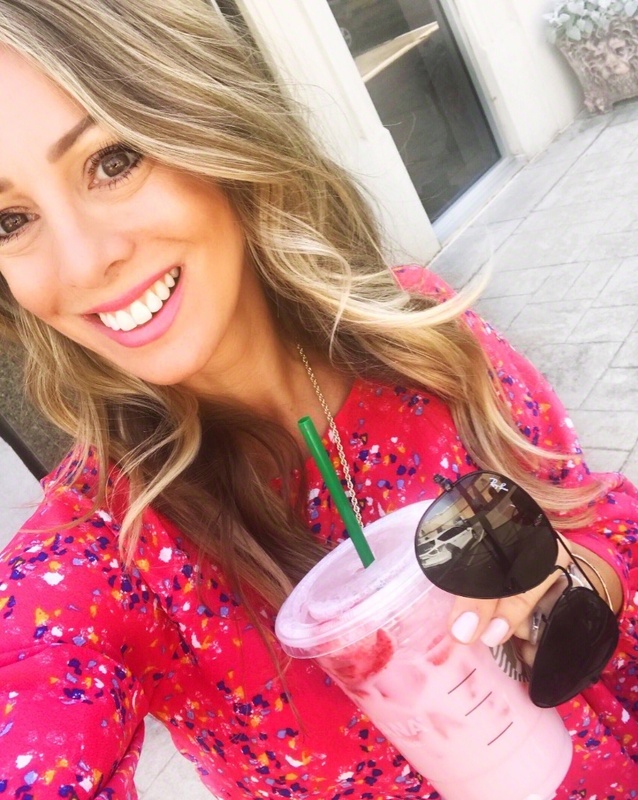 Happy Monday to you! Wow, this looks amazing so far! such a chic idea for thanksgiving. i love seeing this cosmopolitan style rather than all the country fall look you see everywhere. good find on the chevron plates as well! I love every element. Matter fact I have a few pairs I am doing the same thing with the holidays. I love the color combo and the chevron! Chic but no pretense!